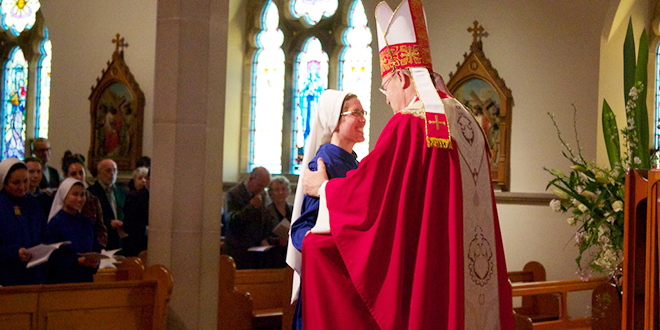 Joyful day: Sr Mary Michael is congratulated by Hobart Archbishop Julian Porteous after her profession. HOBART Catholics witnessed a religious woman’s first profession of vows for the first time in nearly 50 years last month. 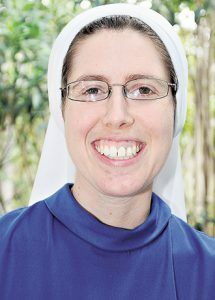 Sr Mary Michael of the Cross, formerly Simone Smith of Springwood in the Blue Mountains, made her first profession as a Sister of the Immaculata on September 14 in Hobart. The newly professed sister joins a small group of six women, including one novice, one postulant, two first professed and a Mother Superior, Mother Mary Therese. Three Immaculata Sisters attended the recent Ignite Conference last month. The Sisters also attended a week-long retreat at Marian Valley in time for Bishop Columba Macbeth-Green’s farewell in early September. Speaking at Ignite Conference, Sr Mary Michael said she grew up a non-practicing Catholic and had never been confirmed as s child. “In Year 11 and 12, I started to question and started to look into the Catholic faith, and intellectually I started to be convinced that I think this is the truth,” Sr Mary Michael said. 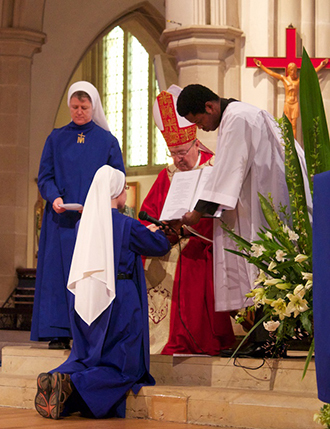 Day to remember: Sr Mary Michael makes her profession to Hobart Archbishop Julian Porteous. After spending three months at a youth leaders’ course in Sydney and attending World Youth Day in Sydney, the 28 year old said she had “strong sense of God calling me to belong completely to him as his spouse”. “I thought it was wonderful and it was new,” Sr Mary Michael said. “But it took another five years for me to actually begin. Sr Mary Michael received her full habit last year. Mother Superior Mother Mary Therese Ramsden said the sisters felt “so encouraged and supported” at the Profession Mass, celebration at St Mary’s Cathedral, Hobart. “In Tasmania, it’s been longer than 50 years, and some people have never seen a profession before,” Mother Mary Therese said. The Sisters of the Immaculata moved to Hobart earlier this year to be close to Hobart Archbishop Julian Porteous who has strongly supported the new religious order since being founded in 2008.